Adorn your modern living pueblo with the futuristic Astrid Oval Dining Table by Eurostyle. A sleek, clean-lined minimalism packs a punch with its elegant curves and stark white hue. Reminiscent of a vase sprouting a delicate blossom, this table lacks the fragility it exudes. It is constructed from a white, aluminum base for sturdy support and can accommodate six guests, their meals, and drinks. The top has been lacquered for style, but also durability from the accidental spill or break. Use this table as a anchor for the pop of bold accent colors you seek in your kitchen or dining area. Part of the Astrid Collection. This table is manufactured to the highest furniture standards in China. What is the lead time for this table and also what it the table top made of? Wood? The Astrid Oval Dining Table takes 2-3 business days for shipment and an estimated lead time of 1-2 weeks for delivery. 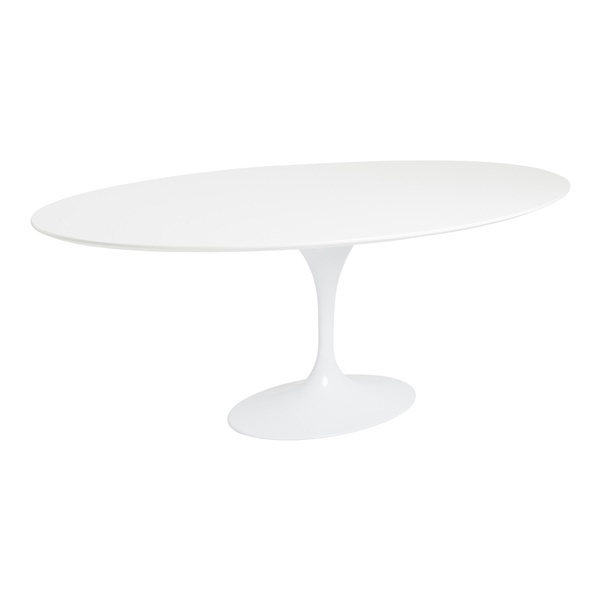 The table top is made from a strong & durable MDF with a matte lacquer finish.